How far would you go to retrieve a lost mobile phone? It seems that mobile devices have been getting up to some serious mischief this week. First there was the man who left his phone at the scene of a burglary , leading directly to his conviction. Then we heard about the Nationwide bank employee who lost a laptop which ultimately caused his bosses to be fined nearly £1 million. 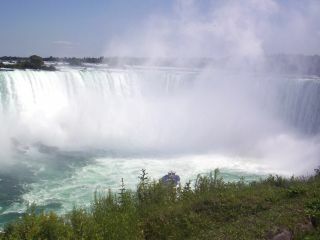 And now we hear about the Polish tourist who nearly threw himself over Niagra Falls to retrieve a phone he had dropped. Waldek Kubicki, 29, clung onto an ice formation for nearly an hour before he was yanked to safety by police using ropes and a harness. "I didn't realise how slick it was. I was just trying to pick up my phone, and I slid down," Kubicki told The Associated Press . Kubicki said he slipped 200 feet down the slope and was very close to being swept over the falls to his death.